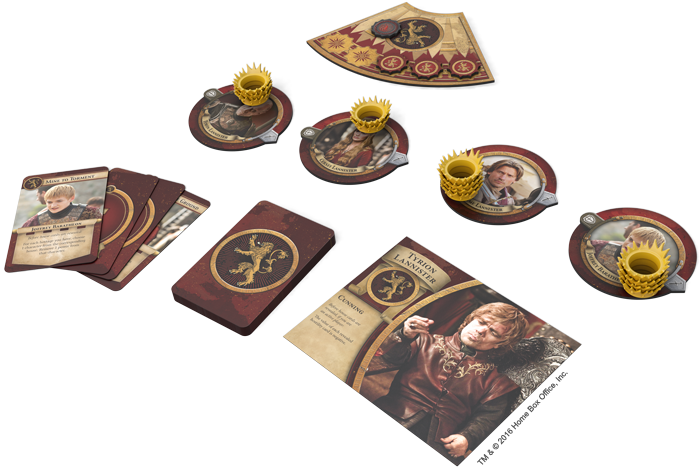 Fantasy Flight Games is proud to announce the upcoming release of Game of Thrones: The Iron Throne, a game of intrigue and influence for three to five players! Using game systems from the legendary board game Cosmic Encounter, The Iron Throne offers uniquely satisfying interactions with the themes and characters of HBO's thrilling television series, Game of Thrones. You and your friends each command one of the Great Houses of Westeros, pitting iconic characters against each other in epic battles and schemes. Negotiate. Bluff. Forge alliances. Threaten your rivals. Use every tool at your disposal to spread your influence, establish supremacy, and claim the ultimate prize: the Iron Throne! Battles, alliances, and betrayals lie at the heart of The Iron Throne. Each turn centers around the resolution of an encounter between two players. These encounters can result in hostilities, startling conquests, and the spread of influence, or they can result in the formation of temporary alliances. And though only two players in any encounter will be the "active" players, your friends might offer you their support… or turn around and offer it to someone else. 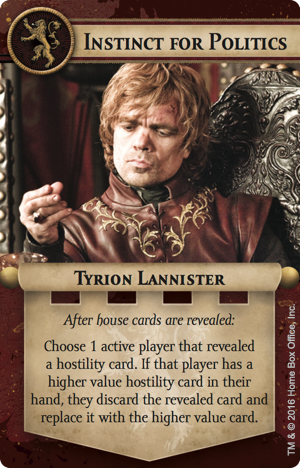 The Lannister player reveals the top card of the event deck, which indicates he should make a challenge against the Stark player. 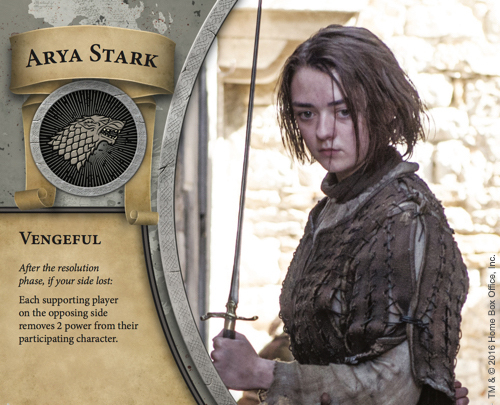 He assigns Joffrey Baratheon, and the Stark player chooses to defend with Arya. Joffrey's five power gives him the advantage over Arya and her two power, but when the Tyrell player offers Olenna Tyrell's support, Stark accepts. Now the combined power value of Arya and Olenna is six, giving them the advantage. There is talk of a truce, but the Starks suspect the Lannisters of treachery and select a hostility card with a value of eight. The Lannisters also play for hostility, adding a card worth six to Joffrey's five power. With Olenna Tyrell's aid, the Starks win the hostility with a total of fourteen power to the Lannisters' eleven. Win enough of these encounters, though—and find the right ones to lose—and you might find yourself in position to seize the Iron Throne. The goal of the game is to spread five of your influence to your opponents' House cards and take the crown for yourself. The encounters of The Iron Throne are so heavily layered with potential for diplomacy, intrigue, and betrayal that the game would be a rich and rewarding experience even if the different Houses were all the same. But they aren't. And the game is richer for their differences. Each of the five Great Houses in The Iron Throne gains strength from five unique characters. At the beginning of a game, you will choose one of them to be your leader, placing its leader sheet before you and setting aside its character token. Then you'll array the tokens for others before you, and they will help you during your challenges. Still, no matter whether they're represented by a leader sheet or a character token, all these characters come with unique abilities. Even when you play the game multiple times with the same House, your experience will change with each different leader. Because your leader's unique ability is always available to you—and visible to your opponents—it makes a massive impact on the shape of your game. 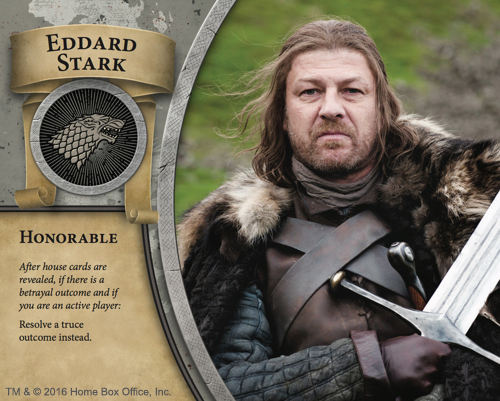 For example, within House Stark, you're bound to enjoy different game experiences when you play with the Honorable Eddard Stark than when your House is led by the Vengeful Arya Stark. Meanwhile, your House deck—the deck of cards that you use during your encounters—contains ten character cards. Divided evenly between your five unique characters, these cards allow you to take advantage of your characters' unique talents whenever they participate in an encounter. 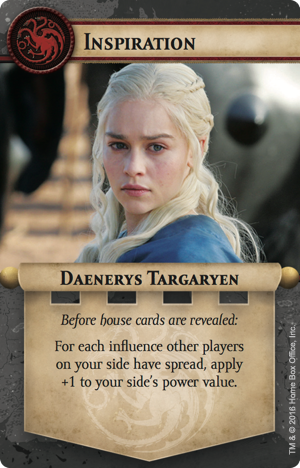 No matter whether you're the active player or lending your support to another House, Daenerys Targaryen's Inspiration could provide a significant boost to your side's power value. Or Tyrion Lannister's Instinct for Politics could alter the outcome of a hostility in your favor. Because each character's personality is reflected multiple times in your House deck, the result is that each house features a distinctive personality, but one that will still change slightly, depending upon the character you choose to lead it. And this means you can experiment with different Houses and leaders to enjoy a nearly limitless variety of play experiences. You can have up to five players, but there's only one Iron Throne. Can you bluff and battle and scheme your way to victory? 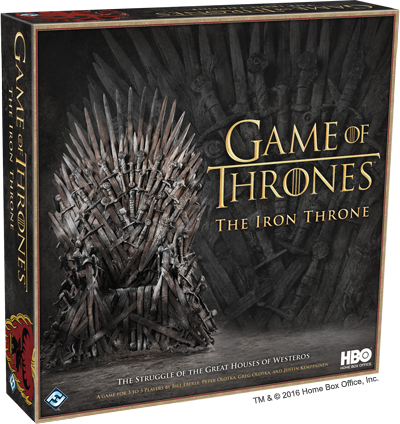 You'll have your chance to find out when The Iron Throne arrives at retailers in the fourth quarter of 2016! Until then, you can visit our our The Iron Throne website for more information and keep an eye to the flames for future previews.